If you haven’t heard us sing its praises before, all these measures give us another reason to urge frequent travelers to invest in TSA’s Precheck. According to the TSA, the removal of these additional items would only apply in regular screening lines. 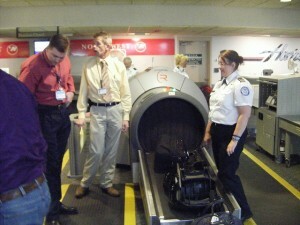 What should you do if you can’t afford Precheck and want to make sure your bag doesn’t get tagged for a manual search? Think through your packing strategy and be organized. Store items that you already know need to be removed in the easy-to-access exterior pockets of your luggage. Consider electing to pull out that special chocolate bar you purchased at a gourmet shop as a souvenir so that it can be screened in plain sight in a separate bin with your jacket or shoes. Have a specific place you always store that favorite book or notepad you plan to use to help you pass the time onboard. While these additional items haven’t been added to the official list, thoughtful packing before you arrive at the airport will help you develop a few habits that could save you some time and avoid unwanted hassle if the list is expanded. How will these new rules, if they go through, affect you? Are you an electronics-only traveler, or do you carry a lot of paper and food as well? Let us hear from you in the comments below, on our Facebook page, or in our Twitter stream.